You are always better as a team. Some are good at one thing which you might lack the skills in. However, you might be better in the other, where they lack the necessary skills. In my case, well, I don’t have any flaws (just kidding, I got plenty) but when I get the chance to work together with someone who is equal or better, then I want to share this with everybody. This is Moritz, co-founder together with his girlfriend and owner of Made To Measure brand, Massura. Since 2 years, they is striving for excellence in his chosen field as a made to measure specialist. 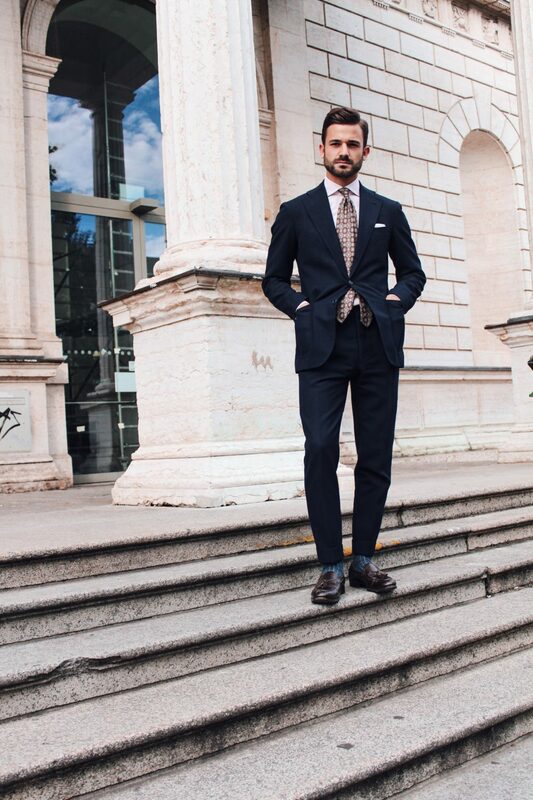 Focusing primarily on the high end market, Moritz aims to introduce the Neapolitan style tailoring to the German market. 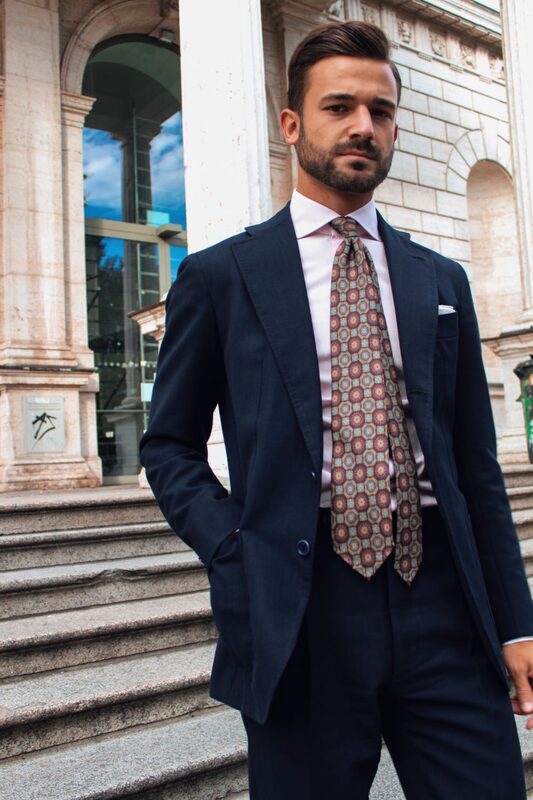 With his success so far he is able to stand behind brands such as Orazio Luciano, Sartorial Dalcoure, Vanacore bespoke shirts and recently added, world renowned shirt maker 100 hands. But you cannot only get a suit, a jacket or a shirt with him. No, he does everything! The beauty of Made to Measure is, you are the designer and you get to choose how the product should fit and feel on your body. 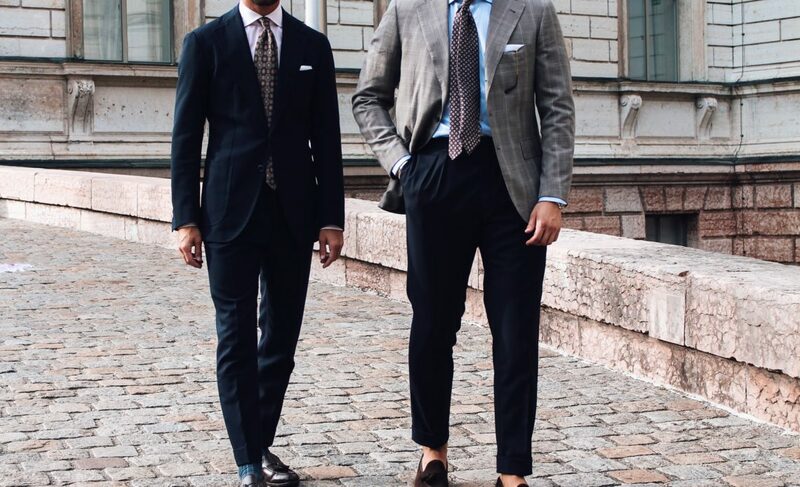 That is also why, if you ask me, you should always go for a MTM or bespoke suit, simply because it will be the single best fit you will have ever had. Despite all that, never forget the quality of a product. 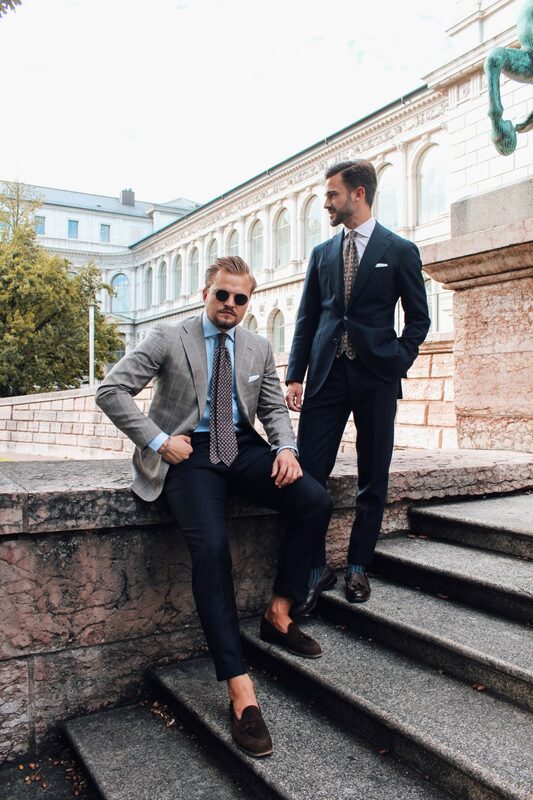 As there are many MTM brands out there and the Asian and East European tailoring services are booming, one must not forget the quality behind the product. Having worked in the same business as a measuring specialist, I know what good and bad quality is. 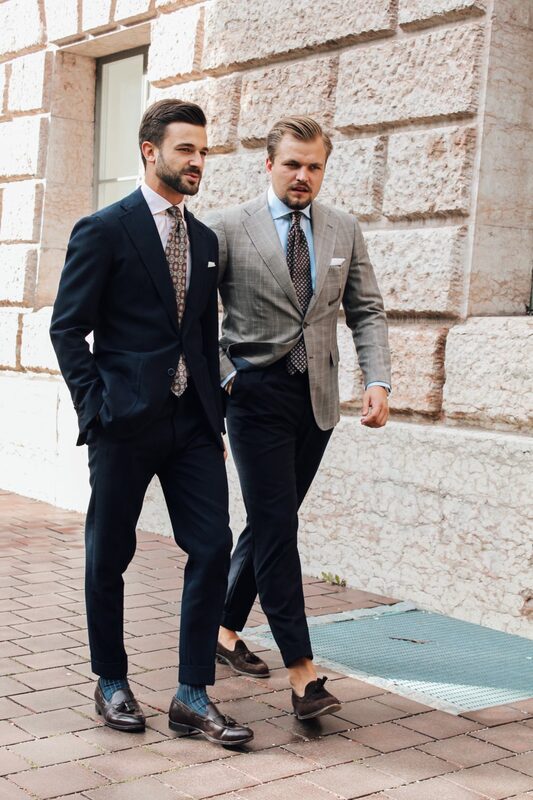 As you can nowadays get a suit at a starting price of 500€, it is tough to say what should be considered “value for money”. Whilst many would agree with going for the lesser option, I have come to the conclusion that the opposite is the case. The love for detail, the structure of a jacket, the longlivity of a trouser and the sartorial excellence of handmade button holes and inner canvas ( you see, I can go on), all this screams for a more valuable product. It is not a real secret, that when you purchase an item for a lot of money, most often than not, the brand name has a lot to do with it as well. However, in a few cases, the work is appreciated and the effort behind the tailor or brand acknowledged. To keep this short and sweet. Before I invest into 7 blue suits, I will invest in a one blue suit that is cut for me with a fabric of my choosing that ideally lasts me the next 10 years 20. I not only saved a lot of money in the long run but when you build your wardrobe, it is totally acceptable to go for in-n-out pieces such as shirts, trousers, jackets, you name it. However, the staples should be of good quality as these are the ones you will be wearing the most. So Moritz and I are strong believers of classic elegance even when it comes down to separates. Whilst he told me that he most of the time in his professional work environment does not wear a tie, I personally love it. I think it just gives of that certain amount of charm and makes you stand out professionally amongst the others. Moritz is wearing his traveller suit made by Orazio Luciano, a high end made to measure tailoring house. Featuring patch pockets, a shorter leg length (his own preference) and the signature natural shoulder line. This suit is ready for anything! 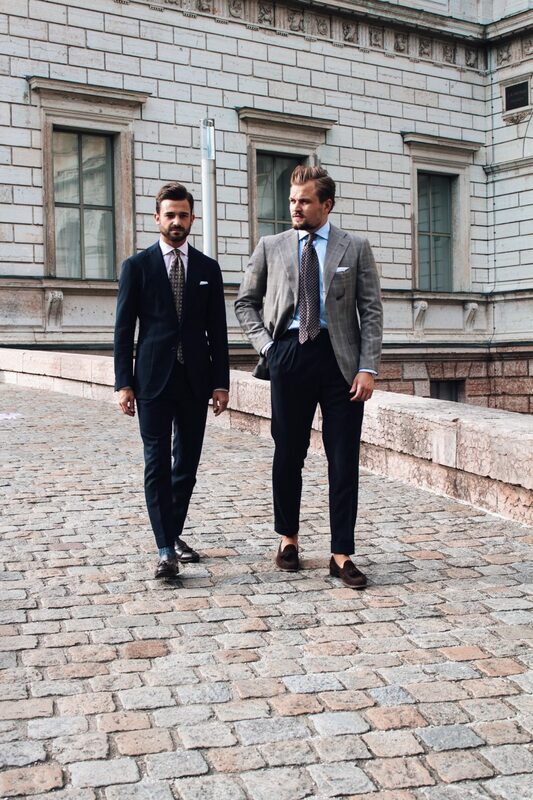 In our age, a suit can be worn with sneakers and a t-shirt. 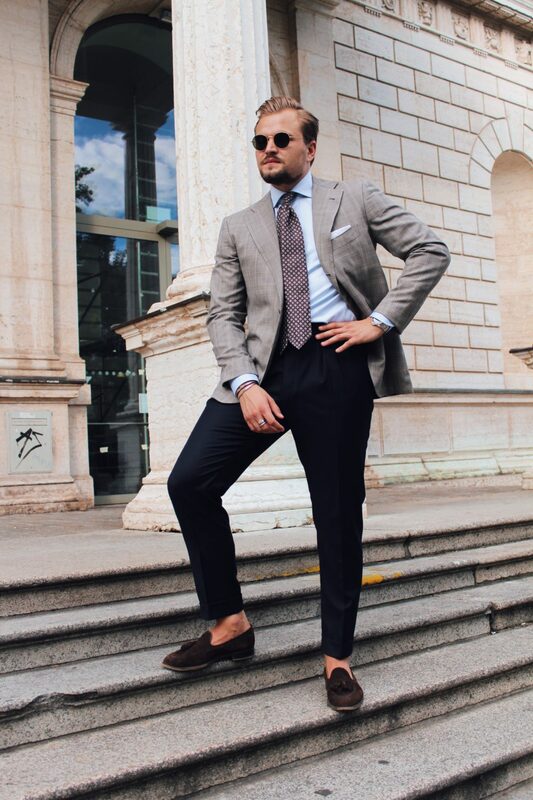 It is my strong belief, as long as the trouser is not too short nor too long, the style can even flatter ones physique and make a very serious suit look more casual. But lets not forget this beautiful combination of shirt and tie with the color symbiosis of pink and purple forming an elegant ensemble. Honestly, this combination persuaded me investing into a pink stripe. You see! Inspiration is in the air for me. Yours truly, is wearing a mix and match combination consisting of two suits. The jacket in a lovely prince of Wales pattern (We will get to this soon enough) in a light grey also made by Orazio Luciano and a pair of suit trousers from my measuring days at Suitsupply. To top it off, a plain blue shirt and a structured tie in order to show a bit of an easy going appeal. If we turn our focus to the feet, whilst Moritz is wearing a sock combination, I am still the idiot portraying no socks. As you know, I don’t wear socks… ever in summer. This is about to change as we are stepping into Autmn rapidly now. Let me know what you think! I would love to hear your verdict about these two combinations.